By now, you’ve probably heard about cryptocurrency. It’s been talked about more in the news lately and you may even know that blockchain and Bitcoin are two different things. But how can they help you? You run a small business or restaurant and you want to be keep your costs low, provide great customer service, and always bring in new clients. The great thing is that you’re perfectly situated to participate in the new global cryptocurrency economy, and it’s now very easy to get involved! We will briefly cover some of the benefits of this new approach to payment transactions and how you can get started accepting cryptocurrency, such as SmartCash. One of the primary goals of any business is to keep your costs low while still maintaining quality. The great thing about SmartCash and other cryptocurrencies is that it can reduce your costs to accept customer payments. With SmartCash, transaction fees are negligible, instant, and not reversible by the sender. This gives you the benefit of eliminating chargeback fraud. Also, funds are available immediately because there is no third party involved such as a payment processor or bank to wait for funds to settle and be sent to your account. You can see that the funds were receive and use them without waiting days or weeks. Being known as a business that accepts cryptocurrencies will attract new customers. Tech savvy customers, millenials, and people who want to be in control of their finances are using cryptocurrency more and more each year. This is a wide audience and a growing mainstream trend. You can get publicity and awareness for your business through merchant directories that list businesses which accept cryptocurrencies. If you operate a business that can provide services or ship internationally, you can also easily accept payments with full confidence that the transaction is complete and has settled accurately by accepting cryptocurrency. Business owners can benefit by participating in a community and becoming trusted and well-known for repeat customers. You too can be a pioneer in this growing community and help your customers enjoy the other benefits of using cryptocurrency. These include maintaining the privacy of your customers because there are no intermediaries or third parties for payments to track transactions. 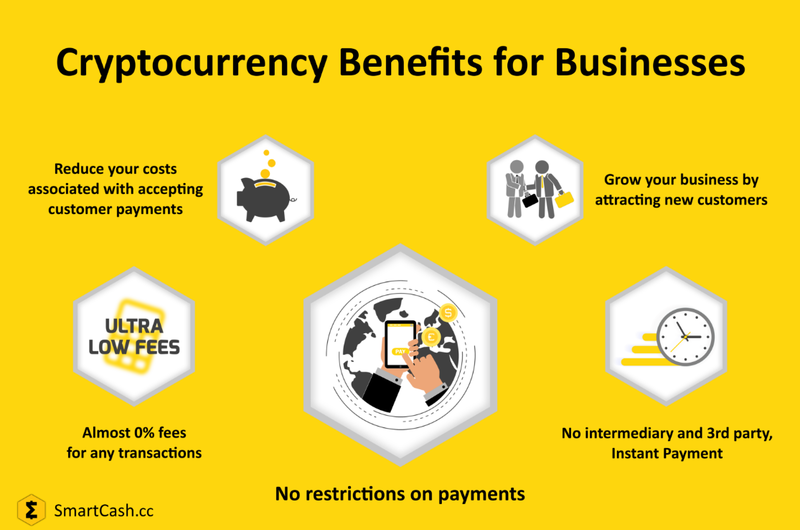 There are also no restrictions on payments because cryptocurrencies such as SmartCash are an independent, peer-to-peer, and permissionless network which allows everyone to send or receive payments. It is also very easy to convert from a cryptocurrency to local currencies for your business accounting by using partners such as with CoinPayments or local exchanges. So how can you get started? If you run an online business the easy way to get started is to sign up for CoinPayments. Here is a guide on how to configure your e-commerce platform to integrate with this payment type. For stores that do sales and transactions in-person we also have a guide on how to use the SmartPay app to accept payments in SmartCash. Finally, you can always use the SmartCash web wallet if you want to include an address to receive SmartCash from invoicing your customers. Once you have set up your business be sure to add your listing to the SmartCash Business Directory to let the world know.